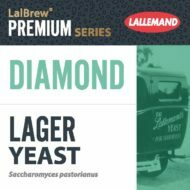 LalBrew® Diamond Lager yeast is a true lager strain originating in Germany. Chosen for its robust character, LalBrew® Diamond Lager yeast delivers excellent fermentation performance, and has the ability to produce clean, authentic lagers. Traditional styles brewed with the Diamond include but are not limited to Munich Helles, Dortmunder Export, German Pilsner, Bohemian Pilsner, American Pilsner, Vienna Lager, Oktoberfest/Märzen, Dark American Lager, Munich Dunkel, Schwarzbier, Traditional Bock, Doppelbock, Eisbock and California Common. Classified as a Saccharomyces pastorianus, a bottom fermenting yeast.